Event has been attended with the crowd of more than 30 industry persons and faculty members of G. L. Bajaj including Director of institution. With the welcome speech by Honorable Director, Dr. Rajiv Agarwal, event has been initiated with the welcome speech for the the eminent speakers on the desk, Asst. 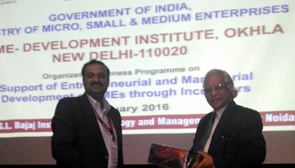 Director of MSME, Dr. Amarnath and Mr. V. M. Jha, Dy. Director of MSME. In the session, Mr. Gautam Km. Rusia, Manager, BHEL, address the crowd with the possibilities available for small and medium industries to have a joint venture and business opportunities with BHEL. He also provided the benefits to be a part of venture and the policies available by the Government of India to support establishment of these industries. Mr. V. M. Dixit, Joint GM, Ordinance Factory, provides the details for the registration of industries with ordinance factory and current projects. In the end of session, Mr. V. M. Jha, Deputy Director, MSME, address the crowd with the introduction of all the policies and available financial funding slabs for the entrepreneurs and established industries.